This research reveals, for the first time, the main users of water in Peru and the inequality in their distribution in indigenous communities. The owners of water is an investigative series that –after a year of research, data analysis, field trips, visual editing and online development– managed to reveal the privileged access to water that a group of companies has in areas of high water risk. The research includes reports, a web application and a short documentary on an interactive platform in three languages: Spanish, English and Quechua. Its is the first time a journalistic investigation is published in the original language of the main affected communities. The reports expose the story and impacts of the indigenous communities located in the highlands of the southern regions of Peru, in Cusco and Apurímac, who lives next to the main copper extraction projects in Peru. The research reveals how a group of companies concentrates the rights of use of the resource in poorest areas that don’t have equitable access to quality water. The research combines data analysis with reporting in the field. 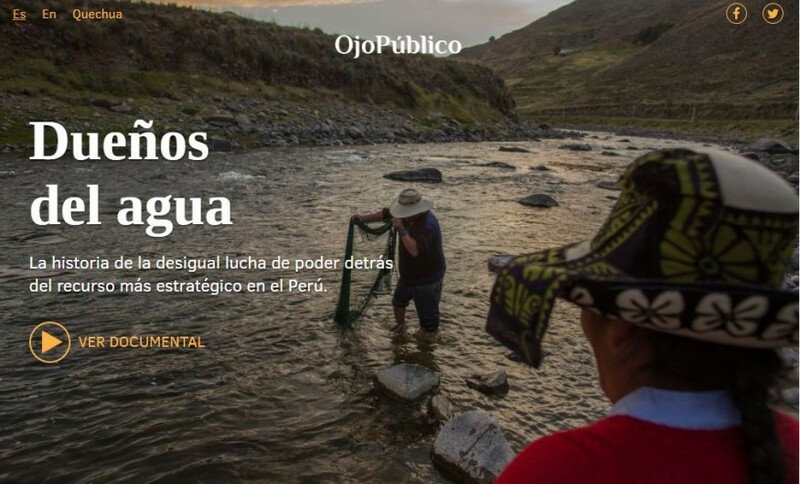 A team from Ojo-Publico.com analyzed almost half a million water use rights granted in Peru in the last 50 years and coverage the southern Andean area to tell stories about the conflict over this resource. The reports also show how the government receives millionaire income from the taxes of these companies, while dozens of neighboring indigenous communities have no access to the resource or other basic services. This research is an unprecedented effort to analyze huge volumes of information on the exploitation of water in the last half century and release that information for citizens in a context of informative opacity on the part of the authorities. The Owners of Water also shows that many authorizations were given without previous studies and violating the rights of indigenous communities, reflecting inefficiency in public spending and the loss of communal property. Help this initiative win the people's choice award by liking and sharing on social media. Ojo Público is a innovation laboratory of investigative journalism and new narratives, that makes reports with the use of databases and new digital technologies. It is the winner of the Inter-American Press Association (SIP) 2017 y 2016, Data Journalism Award 2015, National Human Rights Award 2014 y Latin American Studies Association - LASA 2019.